many sunflowers in my garden! ...some sunflower seeds! So, I have officially launched the "Lulu & The Sunflowers Competition". 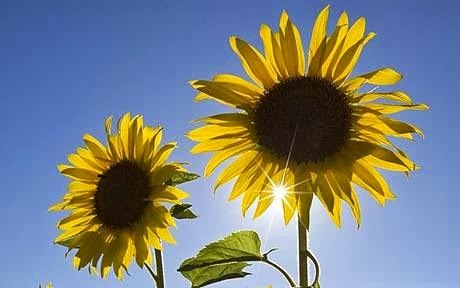 We all have to plant the sunflower seeds and send in photos of us standing beside our sunflowers. The person who grows the tallest sunflower wins a prize, huzzah! as sunflowers on a sunny day? You can plant your sunflower seed straight out where you plan to grow it. You need to wait until the last frost has passed though. Just dig over the soil and remove any weeds. If you don't have anywhere in the garden to plant your seeds, don't worry you can plant them in pots too, just make sure there is plenty space for the roots to grow. Sunflowers like lots of sun (isn't that a coincidence Mummy?!) so choose your spot carefully. Cover your seeds with soil then water them gently. You will need to keep them well watered. As they grow, if they are too close together then thin out your sunflowers so they are 45cm apart, leaving the strongest seedlings. You may need to protect young seedlings from slugs and snails. If you cut the top off a plastic bottle you can use that to protect them. As your sunflower grows you will need to give it some support so add a cane and loosely tie the seedling to the cane. 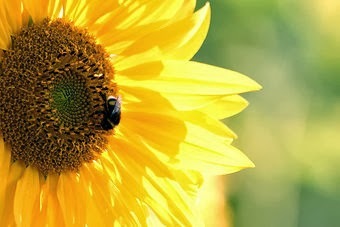 And remember, after your sunflowers have finished blooming, leave the flower heads so the birds can feast on the seeds. another good reason to grow them. I can't wait to get started. I am soooooo going to win this competition! I'll let you know later in the summer how everyone got on. Remember to send in pics of you with your sunflowers in the summer, I would love to see them. P.S. I will need to work hard to beat my friend Jamie - he grew a huge sunflower last year so he has lots of experience already!